I've used Potteries Windows twice now and have been very satisfied both times. Dave and his team are very professional and the price is right. Many thanks John and Julie. Really pleased with Potteries Windows who came to my rescue after I had been let down with 2 other companies. They replaced my misted up double glazing with no problems at all. Highly recommended. Very helpful from the start, once decision made received a quick check from a surveyor, who was very happy to answer any questions and offer advice. Installers arrived and were very efficient with the installation,Very tidy with dust sheets and cleared everything up outside. Would use again for additional work. Here at Potteries Windows you will find a full range of uPVC window products to suit your needs. 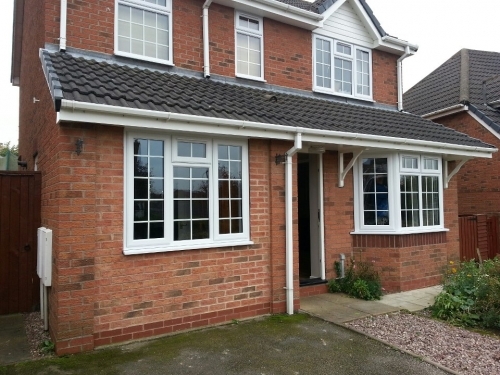 We offer great products of new and replacement uPVC windows Stoke-on-Trent. The new windows makes the house look like new! Now I&rsquo;ll have to have a door to match lol. I will definitely use Conservatories Stoke on Trent when I do. With a difficult plot on which to build my conservatory/office I chose Conservatories Stoke on Trent as they had done work for a friend of mine and I was impressed with the work there, The price quoted for my work was the price I paid and the build was completed on time by considerate tradesmen.